THE STORY: Christopher "Kit" Storm has a moderately successful career as a commercial artist in his Manhattan studio. On occasion he serves as an artistic consultant to police drawing sketches of crime scenes and evidence in lieu of using a police photographer. Kit becomes implicated in a murder when the across-the-hall neighbor is found brutally stabbed inside his studio and the police start viewing Kit as a suspect rather than a colleague. 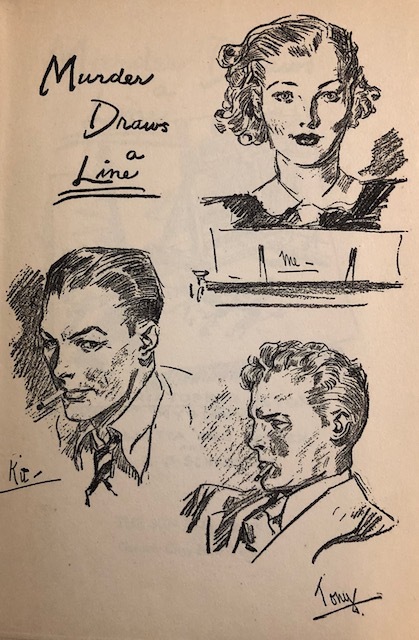 THE CHARACTERS: The narrator for Murder Draws a Line (1940), and the entire series, is Sheridan Locke, Kit's fiancée in this book, later his wife. Sherry is a children's book writer and is cajoled by her artist paramour into becoming the documentarian, so to speak, of their adventures in murder. But she goes about it in an entirely verbose and overwrought manner. One imagines that Sherry read way too many Mary Roberts Rinehart novels in her day (or at least Willetta Barber did). The narration is drowning in words, bursting to the seams with minutiae and unnecessary tangents, and burdened by the often annoying intrusion of the phrase "Had I known..." Even Rinehart never resorted to those telltale words as often as Barber does in the guise of Sherry Locke. 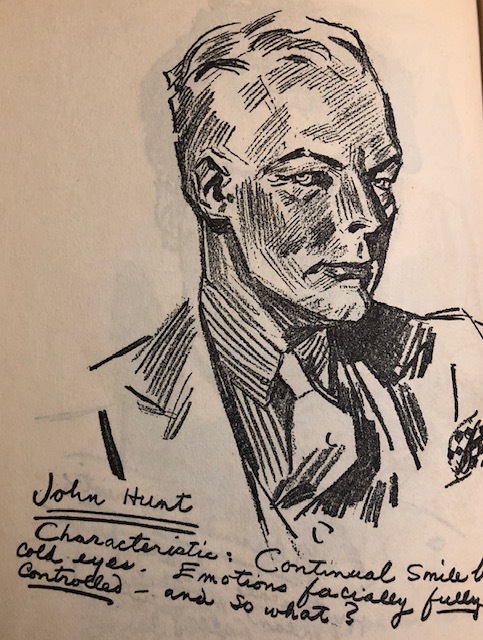 In a review of this book in the August 10, 1940 issue of The Saturday Review the pseudonymous Judge Lynch said "Plot excellent, characters vivid, numerous illustrations -- but superabundance of had-I-but-knowing annoys cranky judge." I almost started to count them all but gave up when it exceeded 15 instances well before the novel's midway point. I sincerely hope that Barber abandons this type of writing in later books because she is a fine storyteller and an excellent plotter. 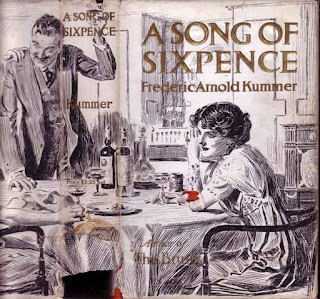 Her debut novel is a fine example of a traditional detective novel and its most unique aspect, what makes it truly noteworthy, is the inclusion of the illustrations (see "Innovations" section for more). She also has the gift of creating nuanced characters who seem like real people. It's a shame that she manages to undermine all her talent by ruining the suspense with all her heavy-handed foreshadowing. Only once did she make it work to her advantage when she discussed a bloody baseball bat before the bat became bloody. The passing remark (coming as the final sentence of a chapter as nearly all these HIBK remarks do) makes you think that Kit will be attacked yet again after being shot at once. In truth, however, the way the baseball bat gets bloodied has nothing to do with Kit and is one of the most horrific surprises in the book. The cast of characters is large and as vivid as Judge Lynch says they are. We get all types of suspects from blustery and temperamental Alessandro Mariotia, a failed opera singer to Albert Putnam, nervous lovelorn singing student of Freda Bransen's. In an attempt to fill in the puzzle of Freda's life Barber finds it necessary to dig into her past and introduce nearly every person she ever encountered. As a result we get several bogey characters who serve no purpose whatsoever and who offer little insight into Freda other than superficial commentary. They exist only as the many examples of vain upper-crusters of Manhattan's elite. However, one supporting player from Freda's past appears to deliver the bombshell piece of evidence. She is a flighty, bubbly and garrulous ex-member of the Metropolitan Opera chorus. Freda has also worked there for a time as did the fiery Marioti. Daisy Jackson (aka Mrs. Elmer Schlummer) is a delight in her one big scene. What she has to say is key to understanding why Freda was killed and wraps up the bigger mystery of why the murder took place in Kit's studio. The story is fascinating as an early example of a murder mystery that revolves around the identity of the victim and her past life. Kit and Sherry knew very little of their neighbor who lived across the hall. Freda Bransen was a lonely spinster who took in singing students as her sole source of income in her tiny studio apartment. But the day she stops by to deliver a letter for Kit mistakenly put in her mailbox changes her life and brings her past speeding into the present. Both Kit and Sherry slowly discover who Freda was, what she was escaping from, and how her past came to bring about her violent death. In one of the most poignant passages in the book Sherry sums it all up: "All at once, as I sat there listening to Daisy Jackeson's blithe and insensate jabberings, the horror attending [Freda's] dying seemed of no great importance. The real tragedy lay in what her life had been, not in the guise of its end. She had had so little, and that little she had not kept for long. A pitiful few years of happiness, perhaps, before her own dark destiny had caught up with her, never to let her again escape. It seemed to me suddenly unbearable that this should have been so." Other interesting suspects include the dentist who lives upstairs, Peter Rollins, who seemed to be too interested in Freda's money; John Hunt, another of Barber's ne'er-do-well New Yorkers who at first seems like a superficial guy with no skills or ambition (he's a part time artist's model) but whose background in the military as a psychologist will play a significant factor in an intriguing subplot; and Ralph Whitley, a friend of Kit and Sherry's who stops by frequently to show off his very good caricature drawings but who is harboring a deep, dark secret. INNOVATIONS: The Christopher Storm mysteries are unique in all of detective fiction because they include Kit's sketches (provided by artist Schabelitz) and some of them include clues to help the reader solve the mystery. I believe these novels were the first of their type. Many detective novels, notably the The Baffle Book solve-it-yourself mysteries also published by The Crime Club, often included maps, floor plans and other sketches to help the reader visualize the crimes. 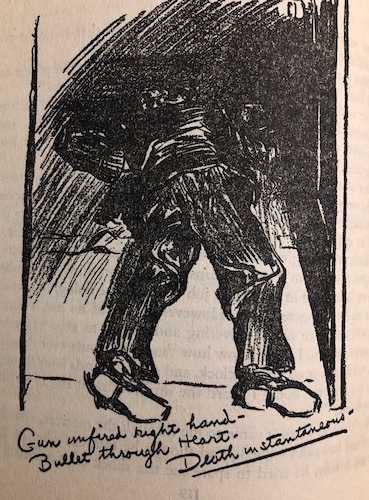 No other detective novels from the Golden Age that I know of include a police artist whose sketches reveal his perceptions of the crime scene, the suspects and curious incidents that add to the mystery. As Sherry says of his method: "Kit has long since given up trying to explain that by drawing he sometimes sees things which would otherwise have gone unnoticed. 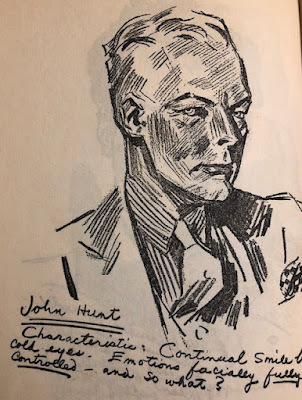 That more than once, what looked perfectly correct to the eye proved completely out of drawing when sketched, thereby giving him a sure clue something was definitely wrong." Tony Shand has learned many times, she continues, the value of Kit's unusual technique in gathering evidence. This is why he often calls on Kit for help and a second eye. Obviously, he cannot avoid Kit's involvement since the crime took place in his own home and workplace. Even more significant is the fact that in this first novel drawing and painting are crucial to the plot. There are two very important sketches which actually reveal the identity of the killer and a work of art that Kit was working on provides one of the most noteworthy clues. The sketches are a mixture of full page portraits, drawings of the rooms, and idly drawn cartoons revealing Kit's thought processes. Most of the sketches include Kit's commentary along the perimeter of the art work. I've included several examples in the post. THINGS I LEARNED: The deluded and vain Marioti exclaims to the police: "I shall be a great tenor. As great even as Melchior." Not being too much of a opera fan I was clueless who he meant. Are you as curious as I was? Probably not, but I'll tell you anyway. Lauritz Melchior was a Danish American opera singer who was the leading Heldentenor at the Metropolitan Opera for three decades, from the late 1920 through the early 1950s. He specialized in Wagner and made the previously lesser thought of German composer one of the better regarded musicians. Thanks to Melchior's fantastic singing, a voice remarkable for carrying over the orchestra, Wagner's work became mainstay of opera repertoire in the US. When Ralph Whitley first appears in Kit's studio carrying a portfolio and talking of his pictures Shery thinks he is "just another Thornton or Model Guild chap, with the inevitable photos." Once again clueless. She is referring to Walter Thornton Modelling Agency, at the time of the story one of the "Big Three" in model agents in New York. Thornton, like many of the characters in this book, started out as an artist's model and then gained connections to the modelling business. He opened his agency located in the Chrysler Building in 1929 and it lasted until 1955. Some of his clients included a bevy of gorgeous soon-to-be movies stars like Susan Hayward, Lizabeth Scott, Lauren Bacall and Grace Kelly. THE AUTHORS: Although a newsletter published by the Doubleday Crime Club claimed that Barber and Schabelitz were married this does not appear to be true. Willetta Ann Barber (1911-1977) married Matthew Smith, an actor and writer, in 1948 and there is no record of her marrying any other person. She was the step-daughter of shipping magnate Edward J. Barber, son of Irish immigrant James Barber who founded Barber Steamship Lines of which Edward became president in 1917. [Small Worldism: In 1942, the Barbers lived in my hometown of Ridgefield, CT on a thrillingly hilly street I regularly rode my bicycle while growing up!] Supposedly Willetta was one of Schabelitz' models according to that same newsletter article. But I have no way of knowing whether that's true or not. You can see a photo of her posing on one of her stepfather's passenger ships here. Just scroll down to the entry on Willetta Ann Scott. Rudolph Frederick Schabelitz (1884-1959) began his career as a portrait painter and exhibited at a few galleries when he was only 22. Quickly he became better known for his book and magazine illustrations. He was one of several well regarded book illustrators who showed their work at The Society of Illustrators' exhibit in 1919. 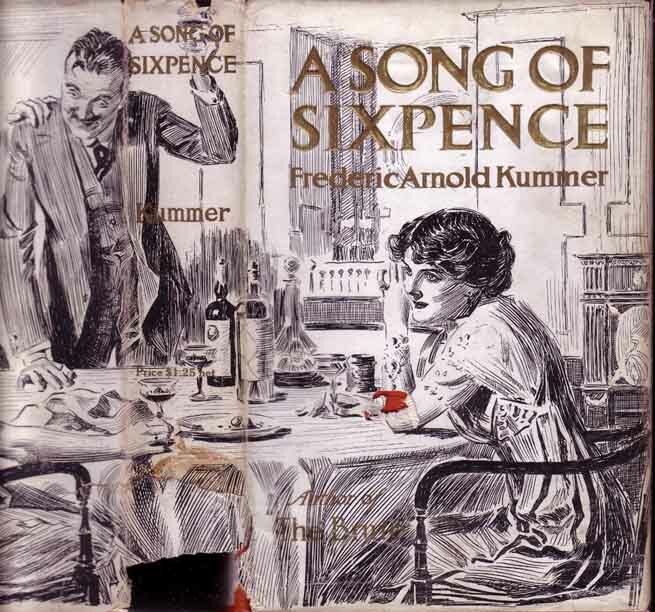 His work is found in numerous novels of the early 20th century, illustrations for magazine stories, and commercial advertising art. one of the more unusual aspects of his career was when his highly prized fashion drawings were offered by The Woodruff Art Service on a subscription basis to department and clothing stores via a trade magazine called The Haberdasher. 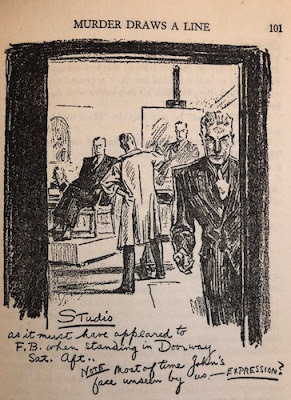 He even contributed the interior artwork to two issues of the Shadow pulp: May 1946 (The Curse of Thoth) and June 1946 (Alibi Trail). Schabelitz was married in 1910 and I found no record of a divorce making the tale of his marriage to Barber even more suspicious. EASY TO FIND? Some of the Kit Storm mysteries were reprinted in paperback, but not his debut in print. 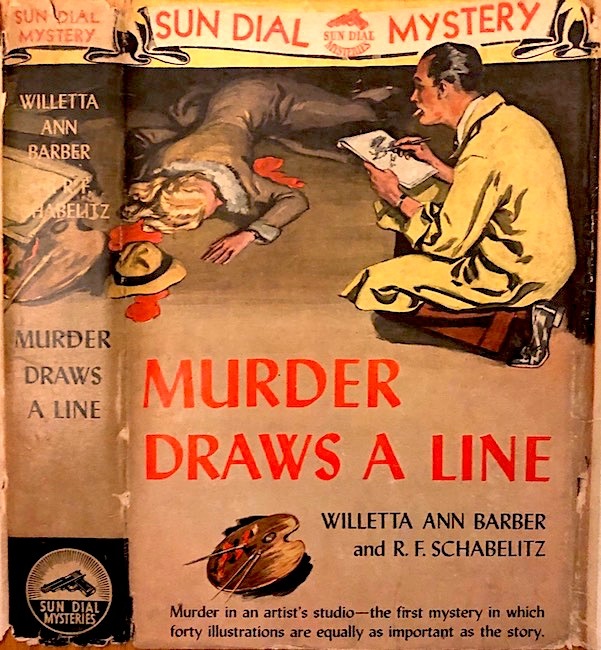 Published only in the US by Doubleday Crime Club and later reprinted by Doubleday owned Sun Dial Press, Murder Draws a Line is relatively scarce. I found only eight copies of both first edition and reprints for sale using the usual online book search services. Only two of those come with dust jackets. Prices range from $29 for a reading copy to $100 for a VG/VG copy with DJ. There are an additional six copies held at various US academic libraries as well as The Library of Congress. It's a possibility your local library may have a copy. The guy I sat next to on the one side when we were at the Edgars had a complete set of these in jackets! I remember you asking me for the titles of some of them that night! And the only two I remembered at the time were Pencil Points to Murder and Murder Enters the Picture. I thought you were telling him to read them. A complete set of the Barber & Schabelitz mystery novels with pristine dust jackets was recently sold in an online auction, but I missed it by several weeks. All seven copies went for a mere $28, plus the commission. What a steal! At least I managed to get pictures of two of the rarest DJs from that sale. You'll see them in coming posts. I have all these titles, too, but only four of the seven copies I own have DJs. The last three books were published by Scribner and are much shorter. Probably had a strict editor who told Willetta to get her act together, cut out all the chaff, and just tell the story! I plan on covering all of these throughout the year. I've had them for over fifteen years now and wanted to read/write about them since I started this blog. Long overdue! Well, well, well, what are the chances? I bought a copy of this - a Doubleday HB with no DJ -- a few weeks ago. I've skimmed the above, since I'm always keen to know as little about a book before I read it, but I'll return with more thoughts when I've read it. In, like, 2031.